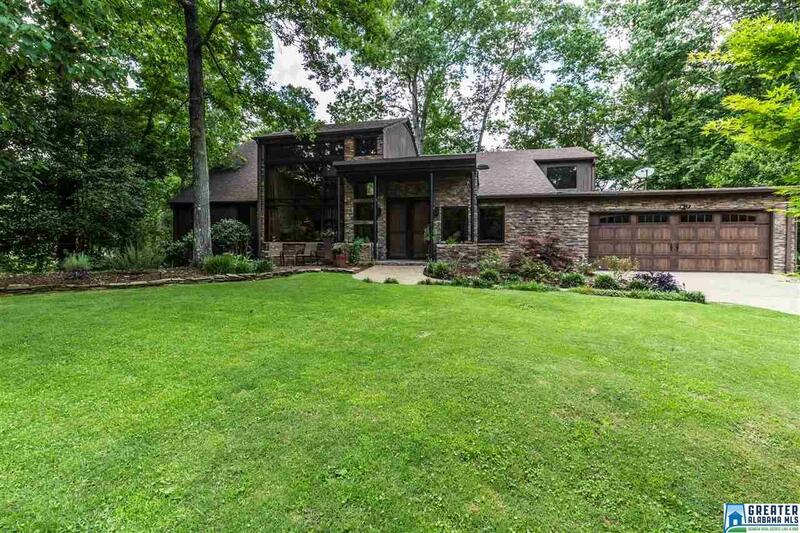 3709 Dover Dr, Mountain Brook, AL.| MLS# 826236 | Richard Jacks UABLIVING.com 205-910-2297 | Birmingham AL Real Estate | Contact us to request more information about our Homes for Sale in the Birmingham AL area. Great home for entertaining ! Mid-century modern home in Mt. Brook has a fabulous layout, stunning living room, large windows taking full advantage of the natural surroundings. Living room features dramatic 2-story ceiling, wall of windows & gas-start fireplace. Open to the dining room, kitchen has custom cabinetry with granite countertops, stainless steel appliances, island with 2 sinks, long counter bar & breakfast nook. Spacious & relaxing screened deck located off the kitchen & includes ceiling fans, electrical outlets & rich wooded views. Main level has a beautiful master suite, den, office, laundry room & 2-car garage. Master bedroom has French doors to the deck, large walk-in closet & lovely master bathroom with granite-topped double vanity, large jetted tub & tile shower. 2nd level has 3 bedrooms & 2 bathrooms, a loft area overlooking living room & walk-in attic with great storage space. It is a truly unique, extraordinary beautiful & relaxing home with great livability.